Integrated technology devoted to the horse considers the interplay of equine body, mind, and spirit. EponaMind offers knowledge and products that enable the horse to educate the team, offering a higher level of awareness. Evidence based technology filters out the uncertainty that surrounds performance and longevity options, giving the horse its own voice. Cutting edge technological products that are user friendly and accessible, and help synergize the support team. EponaMind develops technology devoted to the horse. These are cutting edge technological products that are user friendly and accessible and help synergize the support team. EponaCam, which transforms any smartphone into a 'hoof camera', helps collect accurate data on the hoof. Images of the hoof, both photographic and radiographic, can be measured in our Metron software product. We offer calibration products to ensure that hoof measurements in Metron are accurate. Metron software uses the latest deep learning techniques to automate the labelling, calibration, and measurement of images of the hoof. Hoof care and soundness start with hoof care and how the feet are trimmed. We offer educational resources such as The Hoof book to aid practitioners in considering all the factors that go into a good trim. 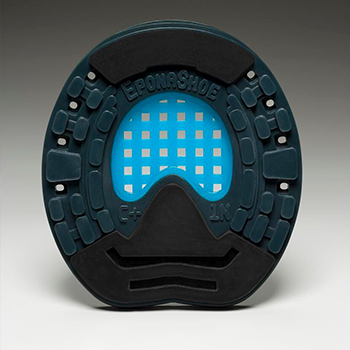 Without a proper trim, no shoe will get the results we wish for; but with a proper trim, the EponaShoe plastic horseshoe is a fantastic tool for hoof care. EponaMind also runs an independent equine research effort, and several of our publications are available on this site. We wish to facilitate the interaction of the team of care-givers by providing products to all three groups: veterinarians, farriers, and owners. We are devoted to the well-being of the horse and have dedicated ourselves to continue that quest. EponaMind is a trademark of EponaTech LLC. Polyurethane horseshoes for comfort, health, and performance. Use your smart phone as a hoof camera for perfect hoof photos. Metron-Hoof version 8.1 now supports the Intellect Module option to allow neural networks to automate some tasks!